John and I have been married 30 years, and we average 147 years of age combined. We have lived all over the world. Over the years we’ve loved our Schnauzers, Poodles, Dachshunds, Chow Chows, Cattle Dogs and Wiemeriners in England, and Baladi Dogs in Egypt. But now we are seniors and we weren’t sure about adopting another dog after our last one, Natasha, died in May 2010. But after a few months passed, we found that we indeed wanted another dog to join our family. We learned about pit bulls through our good friend Micaela. We decided to meet one particular Staffordshire/pit bull/Boxer mix whose face was on the Pit Bull Rescue San Diego website. Her name was Delta and Micaela sang her praises. She had been abandoned, left with her litter of puppies in a cardboard box. 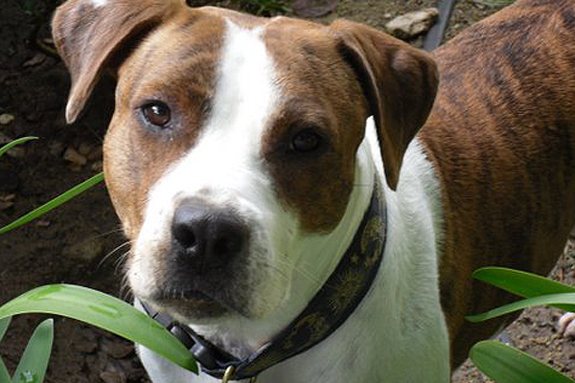 Although her puppies had all been adopted, Delta was still waiting for a home after more than a year in foster care. 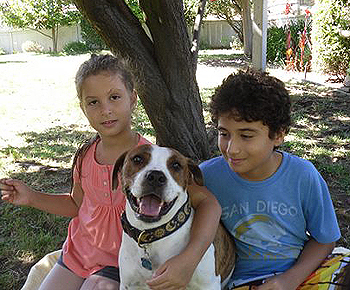 Our grandkids, who have never had a dog of their own, visit us every summer for two months. We wanted them to meet Delta. Delta’s foster mom brought her to our house for an introduction. I remember every detail of that meeting. My grandson, Ali, got a towel to lay on the lawn, and my granddaughter, Hana, had her little 4-year-old fingers ready for some serious prodding. 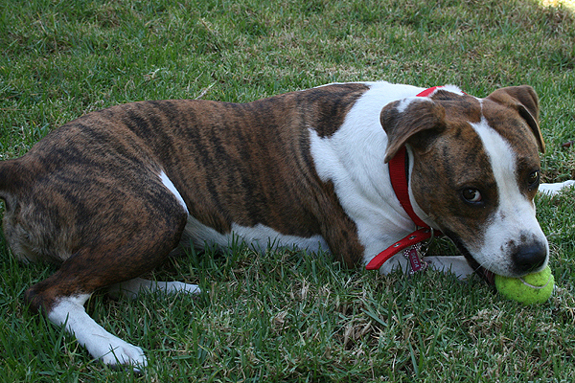 When Delta arrived, she burst into the yard in a flash of brindle and white. Her ears flopped and her smile beamed. Even though Ali is usually shy with dogs, Delta was very gentle with him, and he warmed up to her. Everyone was unanimous in wanting to adopt her. Since the kids departure, John and I have also received much joy from Delta, and we take her everywhere. Or we will be sitting outside Starbucks, and young couples will pass by and dote on her the same way. Pretty soon Delta is reclining in their laps and attracting other passers-by to come pet her. At home she’s just as friendly. She’s a lap dog and enjoys sleeping in the bed. Delta is also full of energy and invites us for a game of chase by depositing her tennis ball at our feet under the computer. What delights us the most is throwing balls in our long yard and watching Delta as her incredible haunches propel her skyward for yet another home run! Now that it’s summertime again, our grandkids are back in town. From Delta’s perspective, she loves children and shows her gentle, playful side best in their company. Hana, almost 6 now, likes it most when Delta puts her “little” head and paws on her lap while curled up on the sofa. Ali, now 10, loves to teach Delta tricks like roll over and give me your paw, which he researched on the computer. Delta is a truly a gift to us all. Wow! What a lovely story! 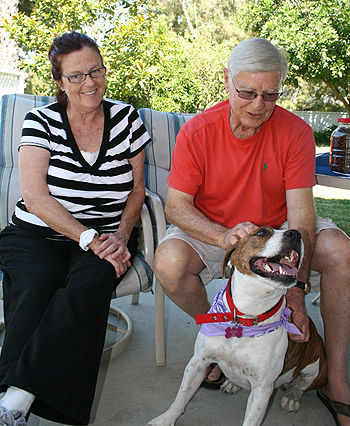 You have captured Delta’s loving, joyful spirit with your words and given her a perfect forever home. I hope you inspire other seniors to follow in your footsteps. @Anne Thanks Anne, we hope it inspires other seniors too! @RoxanaOberding Yes, it is funny, and they are both such wonderful girls 🙂 Thanks for reading this and commenting Roxy! @skreidle She is a sweetheart. Thanks! We love these Happy Endings! YEA! @skreidle Thanks! She is a sweetheart. I can’t tell you just how happy this makes me!!! Delta was is a VERY special girl to me. I spent many hours with Delta and her little ones! She was a wonderful mother, and while all of her babies were amazing, there were two little girls that captured my heart from the first moment I laid eyes on them. They were about 4 weeks old at that time, and it would have been hard to find a cuter pile of puppies than; Spirit, Harley, Ski, Lotus, Jet, Diesel, and Huey! It was just before Christmas when Spirit, and Harley, came home with me to spend the rest of their time in foster care with my family. They WERE the most amazing puppies, and ARE the most amazing dogs! Everyone who saw these girls said how much they wanted to adopt one or the other; it was at the Canines and Cupids adoption event when they both found the loves of their lives. Not long after, Ruthie and Charlie, the BEST adopters ever, took Delta’s Spirit, and Harley home with them, to live the lives that every pup dreams of. I still see them very regularly; I’m always so happy to see them, and they are always happy to see me. When they are with me, I usually call the woman that fostered Delta and pups, and she comes over and we all get to spend time together! Ruthie and Charlie were talking about having a get together with Delta and as many pups as we can round up! Let me know if you might want to do this! I am ecstatic to hear that Delta is in such a wonderful home, with such wonderful people, living the life she was meant to live!! She’s such a sweet, beautiful, gentle soul; thank you from the bottom of my heart for giving her this life!! All of these stories are making me sappy. I love happy endings! My husband, Charlie, and I adopted 2 of Delta’s pups – Spirit and Harley (renamed Zubi). As Lori said, they are INCREDIBLE dogs!! Spirit has her Mama’s same coloring and grin. They both think they’re lap dogs (at 50 lbs, just like Delta). We’d love to do a Delta Family Reunion with as many of her pups as are available. Let us know if you want to join. We are so grateful that they are in our lives and are the best pups I could imagine. So fun, so gentle and so trainable.